I’ll start with an admission: My 2018 blogging year was not as prolific as usual. In fact it was nowhere near the efforts of previous years. But I’m far from downhearted. In fact I’ve thoroughly enjoyed it and I hope you have too. The Statistics. My blog saw a noticeable decline in output, with 25 posts during the year, down from 33 in 2017 and in excess of 60 in 2016. This was entirely due to other commitments such as completing my genealogy studies and publishing a book. Neither was it unexpected – I did forecast this in my 2017 blogging review post. And it is pretty much in line with what I promised: two posts a month. However onto the positives. Despite the downturn in posts, my blog has grown from strength to strength numerically. Views increased from 20,649 in 2017 to well in excess of 21,000 in 2018. Thank you to all those who have taken the trouble to read my random family and local history outpourings. 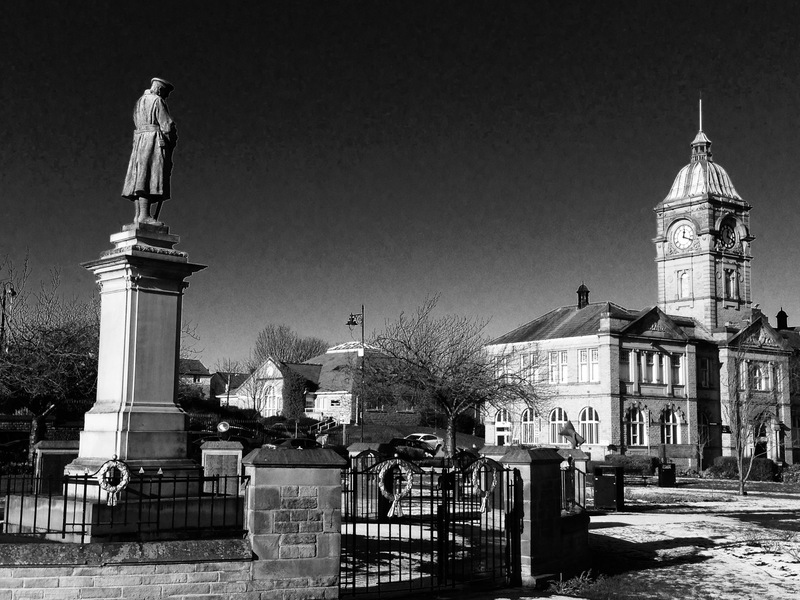 My blog has now well and truly developed its character with core themes of my family history, interspersed with local history tales from Yorkshire, alongside news from – and my musings on – the genealogy world’s latest developments. Most Popular Times? Monday proved my most popular blogging day, with 21% of views. And my golden hour shifted to the slightly earlier time of 6 pm. I suspect this shift is as much a result my blog posting times as anything more profound. How Did They Find You? Search Engines took over as the key engagement route accounting for around 7,000 views. Where Did They Come From? The global reach of WordPress never fails to amaze me. Going on for 100 countries are represented in my list of views. The UK accounted for well over 10,000 of these which was almost double the number of my next most popular country, the United States. Australia came third with over 1,000. But all corners of the globe feature with readers extending to Cambodia, Tonga, Peru and Tunisia. A huge thank you to you all! You’re what makes it worthwhile researching and writing these posts. And it’s fantastic to receive so many comments either indirectly via Facebook and Twitter, or directly on my blog site. They’ve added new information, context and connections. Thank you for getting in touch. General Register Office (GRO) Index – New & Free. This was actually posted in 2016 but, as in 2017, it continued to perform well in 2018 . This post was about a new free source for searching the GRO birth and death indexes (note not marriages) for certain years, one which gives additional search options. It also covered the initial £6 PDF trial, an alternative and cheaper source than buying a birth or death certificate. Note the PDF option, a copy of the register entry rather than a certificate, still continues. However the cost will rise to £7 on 16 February 2019. The cost of a certificate increases from £9.25 to £11. Living DNA: I’m Not Who I Thought I Was. This was another 2017 post which continued to prove popular. It is testimony to the importance with which genetic genealogy is now seen. lt dealt with my shocking DNA results. I’m 100% from Great Britain and Ireland. No drama there. But it indicated that I’m not entirely the Yorkshire lass I thought – the ethnicity pointed to some genetic material from the dark side of the Pennines. I reckon this could be linked to a potential 5x great grandmother from Colne. I really do need to push on with my Abraham Marshall New Year’s Resolution. Cold Case: The Huddersfield Tub Murder. Yet another 2017 offering, and in last year’s “one that got away” category as being one of my favourite posts which failed to reach the Top 5 that year. Well it proved immensely popular in 2018. It dealt with the unsolved murder in Huddersfield of a Dewsbury woman of ‘ill-repute’ whose tragic life and abusive relationships ultimately resulted in her death. “Historical Vandalism” as more Archive Services Come Under Threat. Published in December 2018 its appearance in the Top 5 for the year shows the importance with which any threat to these vital services are seen. It covered some recent swingeing funding cuts to archives and corresponding proposed (and actual) major reductions to these services across the country. Some of the consultations, Surrey (4 January 2019) and Kent (29 January 2019), close imminently. So I would urge you to have your say. Tripe Tales – Food Nostalgia. My childhood memories of food led me to focus on this particular northern ‘delicacy’, which was very popular when I was growing up. It covered some early 20th century local tripe stories including theft, death and prodigious eating feats, as well as recipes to try. I was also inundated via social media with suggestions of where I could still buy it. I’ve yet to confront once more this culinary challenge. So yet again this was a mixed bag of popular posts, ranging from topical family history issues, to DNA and general history and local history tales – which sums up my blog perfectly. Fur Coats Can Prevent Flu – The 1918/19 Pandemic looked at how to use various information sources to build up a picture of the impact of the Spanish Flu “plague” on local communities. In my example I focused on Batley. How the Western Front Association WW1 Pension Ledgers May Have Solved another Family History Mystery. I used this newly available online record source to prove a family tale and discover more about my great uncle. Irish DNA Breakthrough and Don’t it Make My Brown Eyes Blue covered how DNA led to the demolition of one of my family history brick walls and helped me find out more about two of my Irish grandpa’s sisters who emigrated to the United States. A Family Historian on Holiday: A Whitby Cemetery and WW1 Shipwreck was about the sinking of the Hospital Ship Rohilla off the Whitby coast in 1914. With links to the Titanic, heroic rescue attempts and a disputed will it illustrates how a family and local historian is never off duty, even on holiday! Finally there was Published: The Greatest Sacrifice – Fallen Heroes of The Northern Union. This marked my greatest achievement of 2018 and the culmination of around two years’ work, the publication of my book co-authored with husband Chris. It has been described as the definitive book about those Rugby League players who fell in the Great War. What Does 2019 Promise? Well, as in 2018, I aim to do two posts a month. These will be on the same type of themes as usual – family and local history tales, plus topical genealogy offerings when anything big hits the headlines. I will also be including some Aveyard One-Name Study stories. I anticipate my major challenge this coming year, as ever, will be time. I also have the added concern of keeping things fresh and relevant. I now have two other writing roles to add to my blog. At the end of 2018 I took on the role of editor as the Huddersfield and District Family History Society quarterly Journal, the first edition of which came out in January. And I now write a regular family history column in Yorkshire nostalgia magazine “Down Your Way.” So clearly I want to ensure my blog posts are separate and distinct from my other writing commitments. However, my head is buzzing with ideas so I don’t think that will be too much of a creative dilemma. But whatever direction my blogging year takes, thank you for reading, engaging and supporting. Wishing you a happy, peaceful 2019 filled with family history fun! On Saturday I saw my book for the first time. The finished product looks amazing. What began as an idea in the press box at Huddersfield is now one of the definitive history books about rugby league. Scratching Shed Publishing is honoured to publish a tribute to the 69 men who fell in WWI by Chris & Jane Roberts…. Chris and I echo these sentiments. It has been a real privilege to be able to research the lives of these men. The publishers have done a fantastic job, supporting us throughout the process of writing this long overdue and important rugby league history book. But above all this is more than a rugby league book, a sporting history book, or a World War One book. It is the story of the impact of war on individual men and their families from across Great Britain. I hope we’ve done them justice. The book is available from Scratching Shed Publishing at £14.99. I also have copies for sale, which can be signed if required. I can also drop off locally. If so the cost is £13.50. Post within the UK increases the cost to £14.50. Payment can either be via cheque (UK) or bank transfer. My contact email is pasttopresentgenealogy@btinternet.com. The book will also shortly be available from the usual book retailers. If any family history, rugby league or local history groups would like Chris and I to do a talk, please contact me on the above email address. I am very pleased and excited to announce that I am working on a new book. The scary thing is I have a partner in this venture – my husband. Chris is a rugby league journalist, covering the sport for over 30 years. He also shares my interest in World War 1 history and has spent many years studying the conflict. He recently completed an Oxford University online course “The First World War in Perspective” and decided to channel his knowledge into a new project. Many sports have produced books to commemorate their Great War fallen. To date there has been nothing produced to honour all the professional players of the Northern Union, the forerunner of the Rugby Football League. Chris decided to remedy this, and has enlisted my help. It is a huge undertaking. Having written a book for charity about the 76 men on the Batley St Mary’s War Memorial a few years ago I know what a big challenge it will be. Chris is currently identifying all those players on club books at the outbreak of war. In this endeavour he has received fantastic help from the rugby league community, with in excess of 100 players who died now identified. I have started work on the genealogical research angle. It is hoped the book will be published later in 2018, the centenary of the Armistice. War Memorials can be found in churches, towns and villages the length and breadth of the country, inscribed with the names of those who paid the ultimate sacrifice. Years later researching those named can prove problematical, as all that exists on the Memorial is a name. I know this only too well from my Batley St Mary’s research! However some Parishes and Districts went a step further and, in addition to these Memorials, they produced registers and books containing more details about their war dead. This Christmas my parents bought me a limited edition reproduction of one such book, the Upper District of Soothill War Register and Records of War Service 1914 to 1920. The original was compiled by the Rev W.E. Cleworth, Vicar of St Paul’s, Hanging Heaton. Printed by E.F. Roberts in Batley, it was based on a War Service Register kept by the Vicar from the start of the war. The Soothill Upper War Memorial Committee subsequently assisted. When the war ended 1,000 Record Forms were printed, information inserted from the Manuscript Register and then these were distributed to households in the area for correction and additions. Over 900 were returned and these were used in the production of the book, which was truly a parish effort. Copies of the original book are held at St Paul’s Hanging Heaton and Batley library. It is particularly noteworthy that this book contains the names of not only those who gave their lives in the course of the conflict; it includes information about all those from the District who served. So a wonderful record of those who came home and are all too often overlooked. It contains addresses, Units, age when war service commenced, places served, promotions, distinctions and other points of interest about the service careers of those featured. 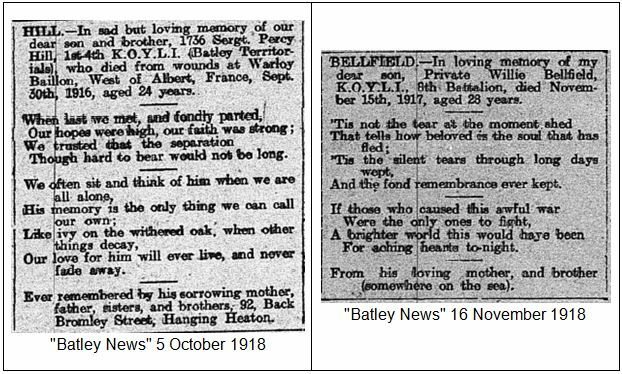 Details of the limited edition reproduction organised by Margaret Watson, including more about the original, can be found in October 2014 editions Batley & Birstall News. However I understand the reprint has now sold out. The book includes a number of men linked to my family tree, including Jesse Hill, so I am so pleased to now own a copy. And I am indebted to Margaret and all those who worked on putting the reprint together. On a recent visit to Lavenham, Suffolk I popped into the local Parish Church of St Peter and Paul to look at their War Memorial. To my surprise and joy beneath their Memorial they too had a book. This one commemorated those who died in both World Wars. A handwritten Book of Remembrance dating from 1922, it was compiled with the specific intention that those who died would have more than their names remembered. There appeared to be a page devoted to each man, giving name, age and address alongside service details and even extracts from letters informing families of their loss. A wonderful lasting legacy for generations to come. These books are particularly poignant because of their “of the time” nature. I wonder how many more are out there? And how many are being reprinted to ensure these men’s memories are perpetuated? 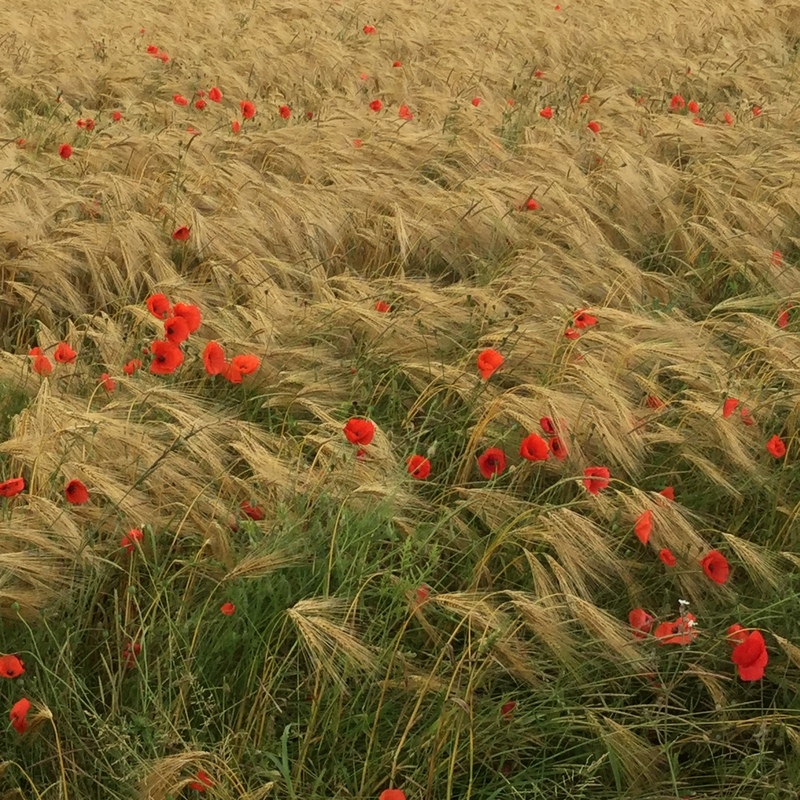 This is the last of my three blog posts in this period of Remembrance. It focuses on the WW1 period. 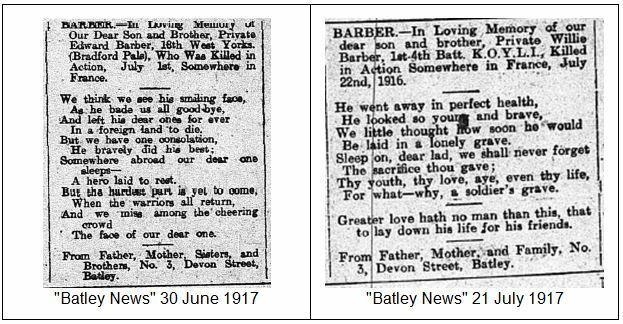 As the Great War progressed and the anniversaries of the Fallen came and went, the local newspaper “In Memoriam” and, later, dedicated “Roll of Honour” columns were increasingly filled with moving tributes to lost husbands, sons, fathers, brothers and fiancées. Although less frequent in late 1915 and throughout 1916, this phenomenon became particularly notable from 1917 onwards and endured in the years beyond the end of the conflict. Many were recurrent standard verses, or variations on standard themes: grief; absence; young lives cut short; a mother’s pain; religious sentiments; Remembrance; doing one’s duty; sacrifice; wooden crosses; graves overseas far from home, or no known grave; not being present in their loved one’s dying moments; occasionally the difficulty of seeing others return; and even reproach for those who caused the war. Although not war poetry, they are powerful representations of family grief and loss which echo across the ages. My mother’s brother died in Aden whilst on National Service in 1955. 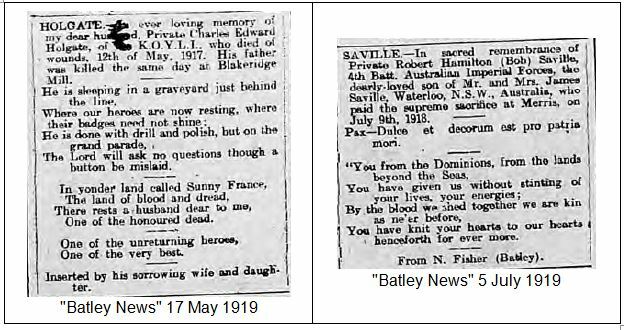 These family tributes from another era are the ones which, in all my St Mary’s War Memorial research, left the greatest impression on her, resonating with her emotions 60 years later. These “In Memoriam” and “Roll of Honour” notices provide an accessible window into this aspect of the War, the emotions of those left behind. They are also a continuing legacy for family historians. They can provide service details, place and even circumstances of death, names and addresses of family members (including married sisters) and details of fiancées all of which can aid research. 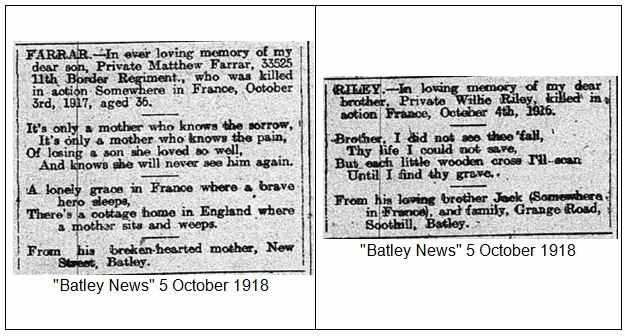 Here is a selection from the local Batley newspapers.